Uni. Paris Diderot, HOBYS Key Programme Consortium. ESA's Herschel space observatory has exhausted, as planned, its supply of liquid helium coolant, concluding over three years of pioneering observations of the cool Universe. The mission began with over 2300 litres of liquid helium, which has been slowly evaporating since the final top-up the day before Herschel's launch on 14 May 2009. The evaporation of the liquid helium was essential to cool the observatory's instruments to close to absolute zero, allowing Herschel to make highly sensitive scientific observations of the cold Universe until today. The confirmation that the helium is finally exhausted came this afternoon at the beginning of the spacecraft's daily communication session with its ground station in Western Australia, with a clear rise in temperatures measured in all of Herschel's instruments. 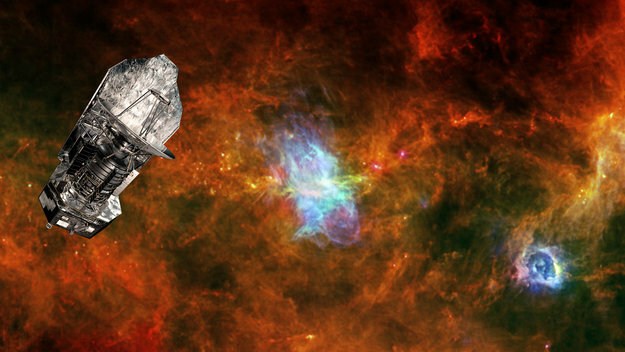 "Herschel has exceeded all expectations, providing us with an incredible treasure trove of data that will keep astronomers busy for many years to come," says Prof. Alvaro Giménez, ESA's Director of Science and Robotic Exploration. Herschel has made over 35 000 scientific observations, amassing more than 25 000 hours of science data from about 600 observing programmes. A further 2000 hours of calibration observations also contribute to the rich dataset, which is based at ESA's European Space Astronomy Centre, near Madrid in Spain. The archive will become the legacy of the mission. It is expected to provide even more discoveries than have been made during the lifetime of the Herschel mission. "Herschel's ground-breaking scientific haul is in no little part down to the excellent work done by European industry, institutions and academia in developing, building and operating the observatory and its instruments," adds Thomas Passvogel, ESA's Herschel and Planck Project Manager. The mission resulted in a number of technological advancements applicable to future space missions and potential spin-off technologies. The mission saw the development of advanced cryogenic systems, the construction of the largest telescope mirror ever flown in space, and the utilisation of the most sensitive direct detectors for light in the far-infrared to millimetre range. Manufacturing techniques enabling the Herschel mission have already been applied to the next generation of ESA's space missions, including Gaia. "Herschel has offered us a new view of the hitherto hidden Universe, pointing us to previously unseen processes of star birth and galaxy formation, and allowing us to trace water through the Universe from molecular clouds to newborn stars and their planet-forming discs and belts of comets," says Göran Pilbratt, ESA's Herschel Project Scientist. Herschel's stunning images of intricate networks of dust and gas filaments within our Milky Way Galaxy provide an illustrated history of star formation. These unique far-infrared observations have given astronomers a new insight into how turbulence stirs up gas in the interstellar medium, giving rise to a filamentary, web-like structure within cold molecular clouds. If conditions are right, gravity then takes over and fragments the filaments into compact cores. Deeply embedded inside these cores are protostars, the seeds of new stars that have gently heated their surrounding dust to just a few degrees above absolute zero, revealing their locations to Herschel's heat-sensitive eyes. Over the first few million years in the life of newborn stars, the formation of planets can be followed in the dense discs of gas and dust swirling around them. In particular, Herschel has been following the trail of water, a molecule crucial to life as we know it, from star-formation clouds to stars to planet-forming discs. Herschel has detected thousands of Earth ocean's worth of water vapour in these discs, with even greater quantities of ice locked up on the surface of dust grains and in comets. Closer to home, Herschel has also studied the composition of the water-ice in Comet Hartley-2, finding it to have almost exactly the same isotopic ratios as the water in our oceans. These findings fuel the debate about how much of Earth's water was delivered via impacting comets. Combined with the observations of massive comet belts around other stars, astronomers hope to understand whether a similar mechanism could be at play in other planetary systems, too. Herschel has also contributed to our knowledge of star formation on the grandest scales, spanning much of cosmic space and time. By studying star formation in distant galaxies, it has identified many that are forming stars at prodigious rates, even in the early years of the Universe's 13.8 billion-year life. These intense star-forming galaxies produce hundreds to thousands of solar masses' worth of stars each year. By comparison, our own Milky Way galaxy produces the equivalent of only one Sun-like star per year on average. How galaxies can support star formation on such massive scales during the first few billions of years of the Universe's existence is an unsolved mystery for scientists studying galaxy formation and evolution. Herschel observations are hinting that when the Universe was young, galaxies had much more gas to feed from, enabling high rates of star formation even in the absence of the collisions between galaxies normally needed to spark these spectacular bouts of star birth. "Although this is the end of Herschel observing, it is certainly not the end of the mission - there are plenty more discoveries to come," says Dr Pilbratt. 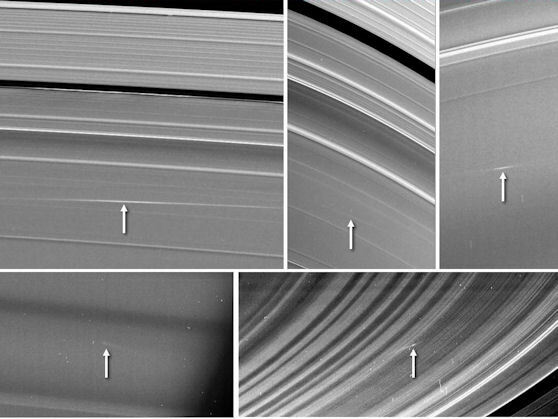 "We will now concentrate on making our data accessible in the form of the best possible maps, spectra and various catalogues to support the work of present and future astronomers. Nevertheless we're sad to see the end of this phase: thank you, Herschel!" Image credit: NASA/JPL-Caltech/Space Science Institute/Cornell. 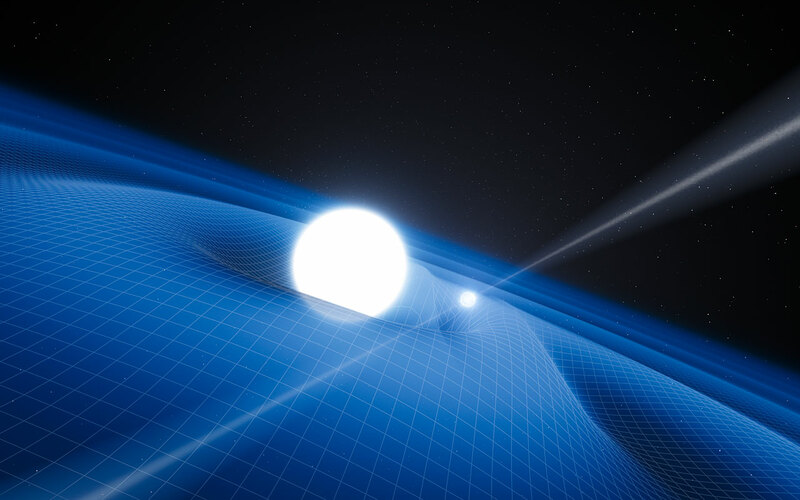 Artist’s impression of the pulsar PSR J0348+0432 and its white dwarf companion. Astronomers have used ESO’s Very Large Telescope, along with radio telescopes around the world, to find and study a bizarre stellar pair consisting of the most massive neutron star confirmed so far, orbited by a white dwarf star. This strange new binary allows tests of Einstein’s theory of gravity — general relativity — in ways that were not possible up to now. So far the new observations exactly agree with the predictions from general relativity and are inconsistent with some alternative theories. The results appeared in the journal Science on 26 April 2013. 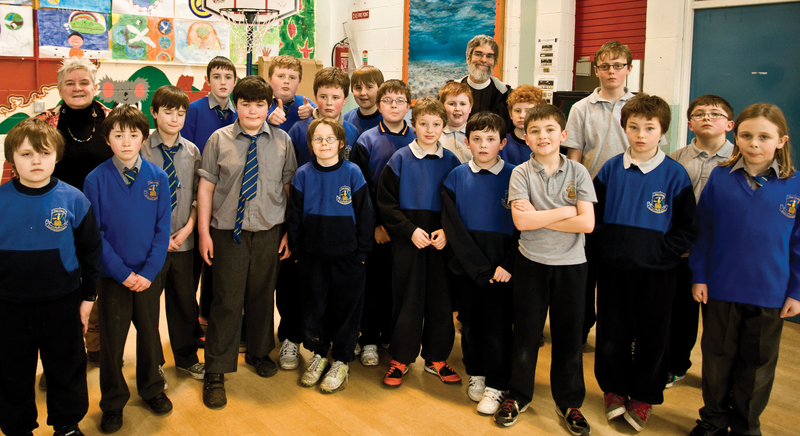 St Cronans National School Bray had a very special visitor on Wednesday March 20. None other than the Vatican Astronomer Br Guy Consolmagno SJ. Originally I had invited him to drop in and shake hands with St Cronans Stargazers our astronomy club, but he very generously offered to give a talk on astronomy for the whole school. 500 boys and their teachers were treated to a wonderfully pitched talk about the Vatican Observatory, the pope’s interest in the subject, the wonders of astronomy and all things that give joy in the vast universe in which we live. The boys asked very intelligent questions, Br Guy gave them a listening ear, and his answers inspired and intrigued the entire audience. Br Guy Consolmagno SJ is an American research astronomer and planetary scientist at the Vatican Observatory. He presented Principal Maeve Tierney with a signed copy of his famous book Turn Left at Orion for the school library. Br Guy was delighted to visit Bray, after lunch in the Martello and a walk on the prom he dipped his hands in the Irish Sea, a rare moment for him in his busy global speaking schedule. I first met Br Guy back in 2005 at the Whirlpool Star Party, at the time I had no clue who he was but we had a warm conversation about binoculars and observing. I was invited to this premier event to give a talk about Enceladus ( one of Saturn’s ice moons) and found out next day that Guy was there to deliver a talk about Turn Left at Orion. We met up again during International Year of Astronomy 2009. Br Guy was on a speaking tour in Ireland. The first of his talks was at the Dublin Institute of Advanced Studies and Dunsink Observatory, followed by Gonzaga College. We then continued on to COSMOS (Now - Irelands leading Star Party) in Tullamore and then to Blackrock Castle Observatory in Cork. If my memory serves me right, Br Guy delivered six different talks in five days to varying audiences. Everyone of them was a polished gem in communicating the science and wonder of astronomy.